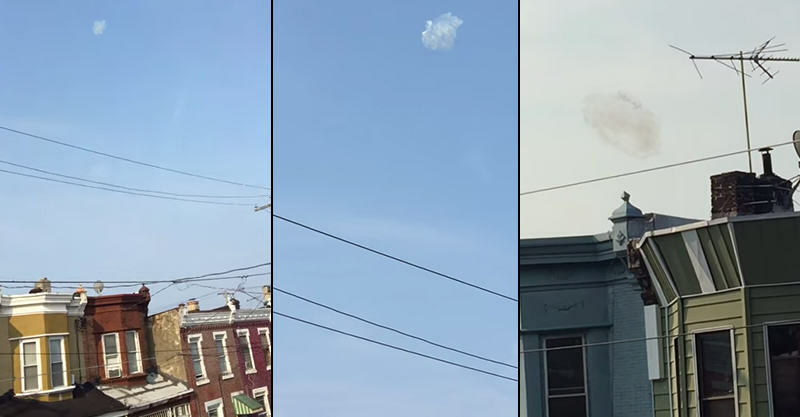 PHILADELPHIA – a man captures an image of a hovering cloud like object over the 7th and Tioga Streets on Sunday he claims to be UFO. Hector Garcia describes the entity as “a cloud coming down from the sky with lights in it” and as soon as he saw the flying object, he grabbed his phone and started recording. Based on how it looked, netizens speculated that it could be some kind of a soapsud that flew off from a factory. But one comment on Garcia’s video said that because it was flying, an object and unidentified, it is indeed a UFO. You be the judge. Watch it here.